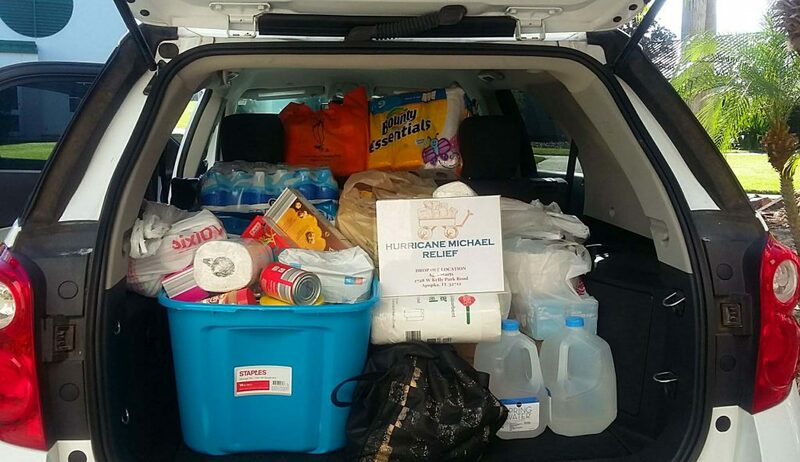 This week, the Central Florida-based UF/IFAS Mid-Florida Research and Education Center offered a helping hand to support the Hurricane Michael relief efforts in the Florida Panhandle. 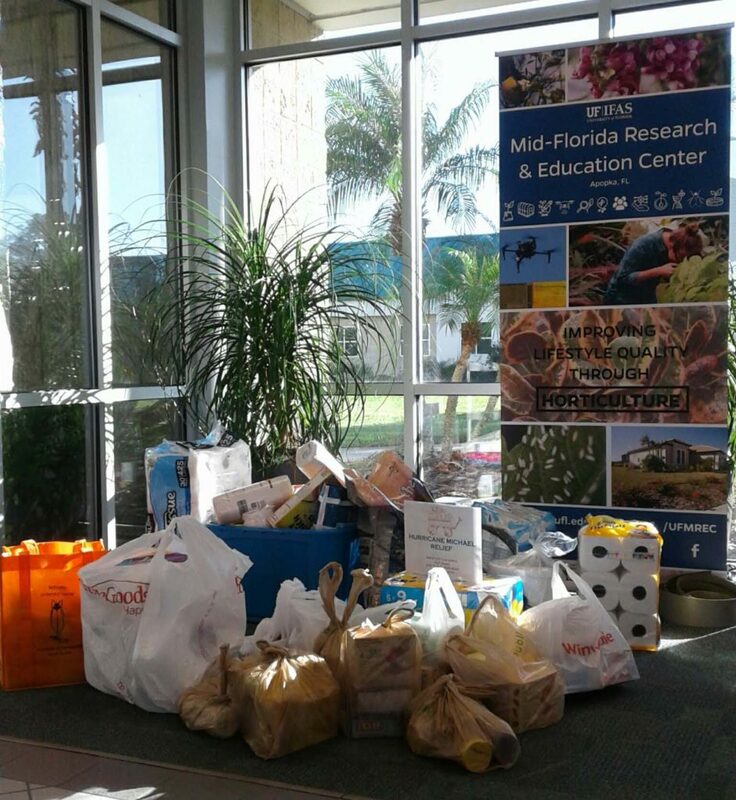 After only a few days, MREC donations accumulated from faculty and staff. Faculty and staff of MREC donated a carload of items ranging from household products of paper towels and toilet paper to food items such as canned goods, non-perishables, like peanut butter and granola bars, and bottled water. ­­­Personal items and day-to-day items like toiletries and sanitary wipes were collected in addition to even some dog food. MREC is a horticulture research and education center located in Apopka, Florida, and works closely with the industry group Florida Nursery, Growers and Landscape Association. FNGLA has chapters in North, Central and South Florida and represents the environmental horticulture industry. Donated items were dropped off at local agricultural company Agristarts to support FNGLA’s Action Chapter Hurricane Michael relief efforts. 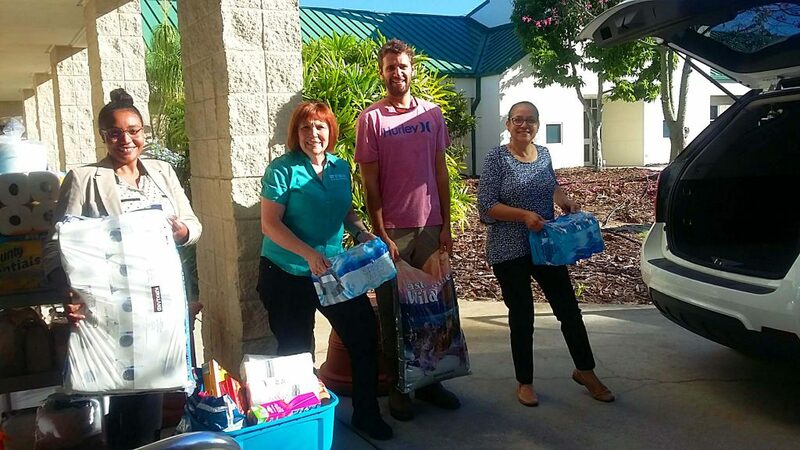 “Our donations will help 90 families with their recovery efforts and we know each item will be put to use,” said Liz Felter, PhD, a MREC faculty member, as she brought the donations to the drop off site. The carload of food and household items ready for drop off. Both MREC and FNGLA hope our neighbors in northeast Florida know even in Central Florida we are here to support them and will continue to aid in the region’s recovery. For ways to donate, additional relief effort resources or to see a critical needs item list, follow this link. To see more ways the University of Florida faculty, staff and students are helping with Hurricane Michael relief efforts, visit this site. Angela is the academic and outreach coordinator at the UF/IFAS Mid-Florida Research and Education Center in Apopka, Fla. She enjoys being outdoors, and traveling, but most importantly breaking down science so it's less scary and easy to understand.